Are your kids growing way too fast? Mom2Mom sales are a great way to shop for gently used baby and children’s items for your family. 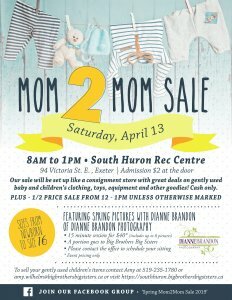 Our sale will be set up like a consignment store with great deals on gently used baby and children’s clothing, toys, equipment and other goodies. Check out the clothing racks according to size, and each table set up according to item. Selling items from Baby up to Size 16, including maternity!